Shareholders will vote on whether JPMorgan should appoint an independent chairman at its annual meeting on May 21. JPMorgan Chase's (JPM) larger-than-life CEO appeared to survive the London Whale -- the bank's big bet on derivatives that resulted in nearly $6 billion in losses -- with his power undiminished. But one year later, he is under fire from a wide swath of shareholders who are pushing the board to strip him of his role of chairman. On top of that, one of the most influential shareholder advisory firms, ISS Proxy Advisory Services, also recommended that shareholders vote against three of the bank's long-serving board members. The three directors, Honeywell (HON) CEO David Cote, private investment adviser Henry Crown, and the American Museum of National History's CEO Ellen Futtter, all served on the bank's risk oversight committee, and were most responsible for overseeing the trading operations that led to the London Whale losses. Glass Lewis, another shareholder advisory firm, also advised clients to push for an independent chairman. Glass Lewis went even further than ISS and told clients to vote against 6 of the 11 board members who are up for re-election. If these groups hold sway, Jamie Dimon could be faced with a new, less agreeable board. ISS also criticized JPMorgan's entire board for a lack of independence. In the face of the massive London Whale trading losses, "the board appears to have been largely reactive, making changes only when it was clear that it could no longer maintain the status quo," ISS said. David Larcker, a professor of corporate governance at Stanford Graduate School of Business, said ISS typically succeeds at influencing the votes of between 25% to 30% of shareholders. Last year, 40% of the company's shareholders voted to replace Dimon with an independent chairman. But shareholders were more willing to keep the same board in place. Of JPMorgan's 11 directors, 10 received more than 95% of a vote to keep them. Ellen Futter received the least support, and she was still backed by 86% of shareholders. Shareholder votes don't necessarily dictate a board's actions. Corporate boards are only meant to use these votes to inform their decisions. Even if a majority of shareholders ask for an independent chairman, the board doesn't have to comply. That said, a vote against the status quo can become a public relations nightmare for the bank. "Once you start getting this push from outside shareholders, it becomes a long, time consuming thing for the board and the bank," said Stanford's Larcker. ISS isn't the only shareholder who has been actively pushing for Dimon to exit his chairmanship. The nation's largest public pension system Calpers has pushed for an independent chairman at the bank for several years. But this year, Joe Dear, Calper's chief investment officer, said pension funds holding JPMorgan shares have been more proactive in coordinating their votes. To be fair, Dimon is still revered for his work leading the bank through the financial crisis and even past the London Whale debacle. But some of the largest shareholders that praise his work also think the bank would fare better if his power was diminished. "Jamie Dimon is one of the most talented CEOs in the world," said Dear. "With [his] outsize personality, it's important to split the jobs of chairman and CEO. It's a bedrock principal of corporate governance." 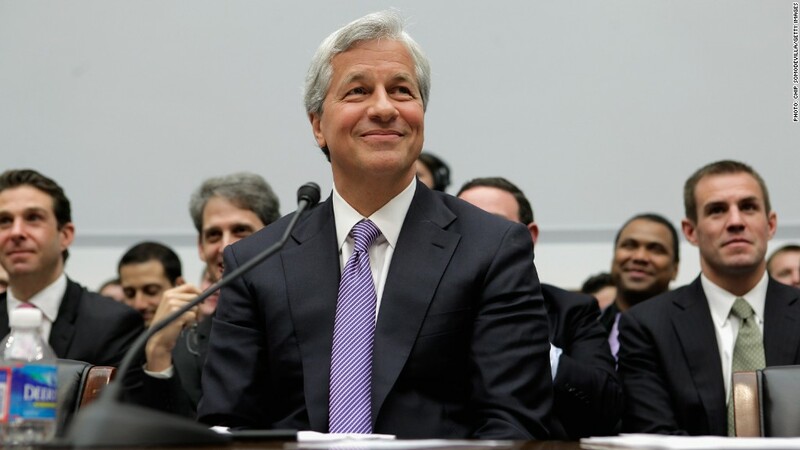 The board has said it will back Dimon as both its CEO and chairman.In the runup to the May 21 meeting, the bank is actively talking to shareholders to help convince them that Dimon is needed in both roles and why their board members should be re-elected. In an SEC filing, the company's board said Dimon as CEO and chairman is "the most effective leadership model for the Firm." Still, some shareholders, such as revered Berkshire Hathaway (BRKA) chief Warren Buffett who personally own the bank's shares, still think Dimon is the right man for both jobs. (Berkshire Hathaway is not a shareholder). At his annual shareholder meeting in Omaha, Neb., Buffett told Bloomberg Television: "I couldn't think of a better chairman."